Covenants not to compete are meant to protect a business but can harm the employee and prove unenforceable. JMCO partner Roger Swanger explores how to approach such covenants in regards to exit planning. This dilemma is quite common in the closely held businesses. If, for a moment, you accept a basic tenet of Exit Planning–that the successful exit planning path is paved by a good management team–then you must also accept that losing management team members as your exit approaches can be fatal. The damage to an owner’s exit plan and to the business of losing key people is magnified when employees leave and take other employees, customers, trade secrets, and long-term vendor relationships. The departure of key employees for any reason can harm your company and consequently your own exit. The most common tool owners use to prevent a departed employee from harming the business is to put in place an enforceable covenant not to compete. There are two immediate and significant hurdles that make this easier said than done. First, covenants not to compete restrain a person from freely engaging in his or her trade or occupation. For that reason, they can cause harm to that individual and to his family. Restraining an individual’s actions strikes at the heart of our American concept of liberty and freedom of action. Restraints or restrictions upon one’s ability to earn a living are therefore limited and, in many cases, prohibited. Secondly, even when permitted many employers are reluctant to present their key employees with a written covenant not to compete for fear that the key employee will become angry and do exactly what the owner does not want–leave the company! Adding insult to injury is the fact that covenants not to compete are unenforceable when the employee is not given fair consideration in return for signing the covenant. I recently met with two co-owners of a business to discuss a possible sale of their company. When I learned that they had owned the business for only five years, I was shocked. Their company had over 125 employees, $10 million of revenue, and made almost $2 million a year in profits. “How in the world did you create such a vibrant business in such a short time?” I asked. “Didn’t you have covenants not to compete?” I asked. Could this happen to your company? Given the hurdles that need to be overcome, is it possible to create enforceable covenants not to compete in a manner that is not offensive to your key employees who will be asked to sign them? What can you do? Is it possible to create enforceable covenants not to compete in a manner that is not offensive to your key employees who will be asked to sign them? Our answer is: Yes, in most states, if you follow the very specific guidelines laid out in your state’s case law. For that reason, you must check with experienced legal counsel in your state to determine the conditions under which, if any, covenants not to compete are enforceable. In most, but not all, states, covenants not to compete are generally unenforceable except or unless they meet certain rather narrow exclusions—exclusions which often apply to key employees and management. Each of these three standards is usually subject to numerous State Court rulings and interpretations. It is this case law that guides your attorney when drafting covenants for your employees. You and your attorney must attempt to determine what a particular management employee can do to harm your business should he or she leave it so that the agreement is not so broad as to be prohibited. Once you have identified specific threats, your attorney will draft a covenant that prevents that employee from doing that harm. As a general rule, the shorter the term of the covenant, the more likely it is to be considered enforceable. Of course, if a covenant not to compete is too short in duration, it does not effectively prevent competition. If the covenant restricts activities longer than two to three years, courts may question its “reasonableness.” Like every other exception described in this newsletter, consult with your attorney to see how each issue is handled in your state. You and your advisors must also determine the geographic scope in which it is appropriate to prohibit competition. For example, if your business is geographically quite concentrated, an effective covenant might restrict a particular management employee from doing business within that limited area (perhaps the county in which your business is located or a surrounding geographical area) rather than in the entire state in which you are located. As you wrestle with determining what is “reasonable,” you can reasonably expect courts to be less inclined to strike down a covenant not to compete when the employee can still engage in his trade or profession. Neither courts (nor your key employees) will favor covenants not to compete unless key employees receive valuable consideration in return for signing. When you think about incentive programs to motivate and keep your key people, consider that the additional money or value provided by that incentive program may well be sufficient consideration to satisfy both your key employees and your state’s courts should a subsequent dispute arise. 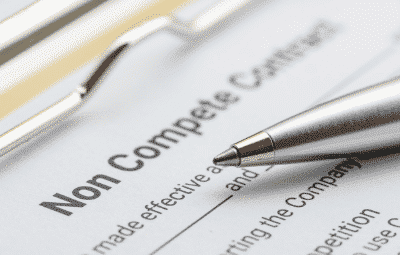 Another exception to the general rule prohibiting covenants not to compete is to include a covenant not to compete as a condition of ownership in the business. For example, if the two key employees described at the beginning of this article had been granted (or they had purchased) ownership in their original employer and along with that ownership signed reasonable covenants not to compete, their ability to leave—and in effect bankrupt their former employer within 18 months—could have and would have been prevented in the state in which they lived and worked. Further it is entirely possible that had sufficient incentives and rewards been offered to our two key employees, especially subject to some form of vesting, they might never have left. These two concepts work best in tandem, and, perhaps only in tandem. It’s a tricky situation when considering covenants not to compete, so consulting with a professional is important. James Moore’s transition planning CPAs can help you sort through the applicable laws and best practices to safeguard your business, satisfy your employees and ensure that your exit plan goes as smoothly as possible.